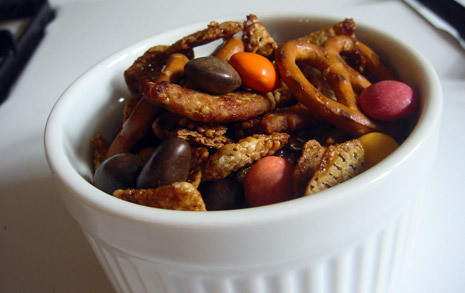 My husband is off to ski for�the weekend with some buddies, so I thought I would make up a big batch of home-made snack mix for the boys to munch on.��If you have ever even glanced at the nutritional information�or the ingredients of the popular pre-bagged mix, you’ll know why I’d prefer to make my own!� Plus, it’s more fun to personalize it with your own favorites and snack a little in the process.� Below is a recipe using some of my favorites that I found in about 10 minutes just walking through the bulk and cereal isle at the co-op. -Spread the mixture over the 2 pans and bake for about 15-20 minutes, stirring gently 1-2 times during the baking. -Let the mixture cool either on paper towels or new pans.� Once the mixture has cooled completely, gently mix in the “good stuff. The best thing about this recipe is that you can really make it your own by changing the amounts of the ingredients you like, or don’t like, and by adding your own “good stuff” like raisins, sunflower seeds, nuts, or chocolate covered something or other.� Be creative and go crazy.